Artwork by @kimcarlika (one of our 2017 Illustration competition winners). Here at Book Box Club, we are huge fans of bookish-inspired art. 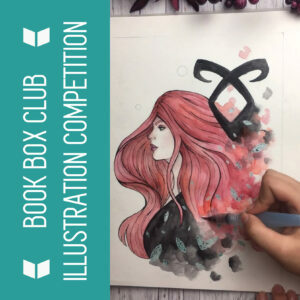 Scouring the Internet, social media, exhibitions and shows for new illustrators, designers and typographers to create artwork for our boxes, is one of our favourite Book Box Club jobs. For those of you who have been following our adventures (or subscribed to our boxes) for a while, you may remember that last year – in a bid to make new arty friends and find potential collaborators for our future boxes – we hosted the first ever Book Box Club art competition and created our inaugural Unashamedly Bookish calendar with the winning entries. The calendar was included in our January Geek Unite boxes and filled with illustrations of your (and our!) 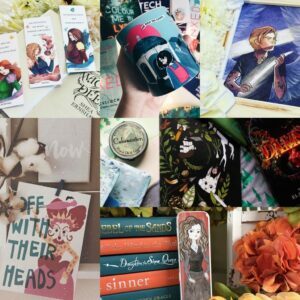 favourite bookish characters. Since discovering so many brilliant new artists via our competition, we have gone on to commission artwork from many of the winning illustrators, who have helped us create some gorgeous exclusive Book Box Club items! 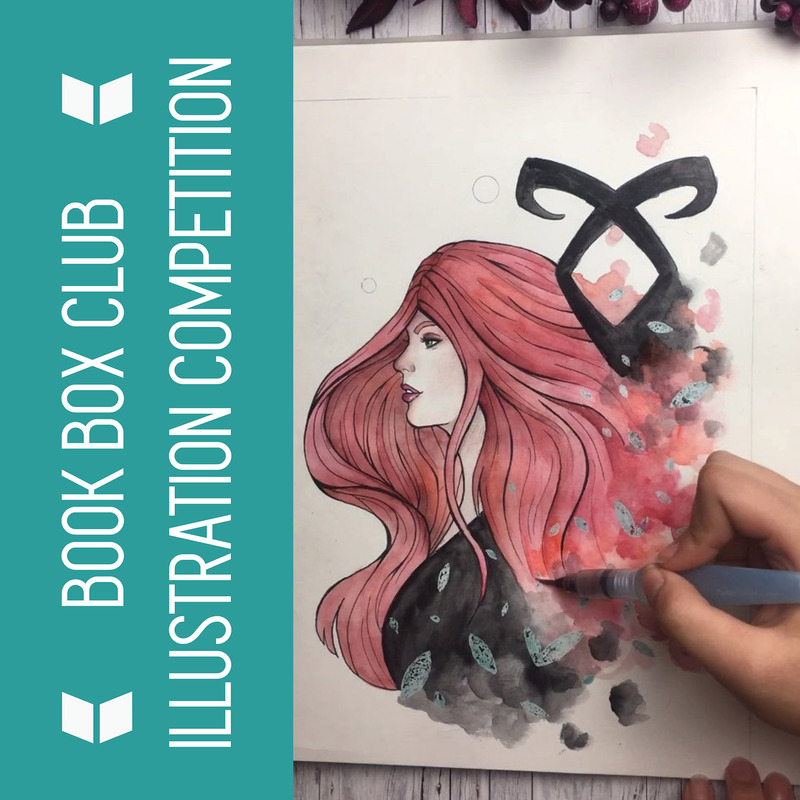 We were bowled over by all the talented people who entered last year and we couldn’t help but get the feeling that there were lots more talented artists who would be perfect for Book Box Club, but who we are yet to discover. We can’t wait to promote more talented arty types and unite artists with bookish fans. We’re looking for talented artists, illustrators, graphic designers and typographers to help us create our exclusive Book Box Club Unashamedly Bookish 2019 calendar. The theme is your favourite books and what it means to be bookish and we’ll be asking entrants to submit a piece of artwork inspired by this topic. 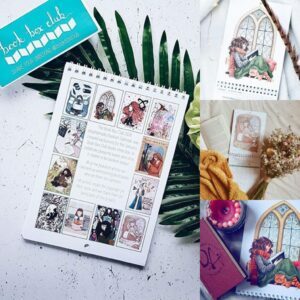 In December 2018, we’ll compile the work of all of the twelve winning entries into one gorgeous bookish calendar and send this out to all of our subscribers in their December box. All artists will be fully credited and social accounts and websites will be listed alongside their illustrations. We’ll also be shouting about all of our winners on social media, our blog and our website. In return for the use of your lovely artwork we will promote you and your work. We’d also love to use this opportunity to find new artists to work with us on future book Box Club items. 1) AN IMAGE: which must be portrait (i.e. as opposed to landscape) and of a high quality (300 DPI). The image could be either one that you already have or a brand new piece that fits in with the theme of favourite books and what it means to be bookish. We can’t wait to see what you come up with! 2) A SHORT AUTOBIOGRAPHY: Tell us about you, your art and inspirations (in just 40 words) and we’ll include your biography alongside your artwork. Please also provide your social media or website links for inclusion in the calendar. That’s it! Please submit your entries by Tuesday 20th November at the latest. We’ll pick our 12 favourite entries by 22nd November and we will contact the winners via email. We’ll be picking the winners based on the artwork, so please don’t be put off if you are new to social media or you don’t have a massive following, in fact we are especially excited to come across artists we’ve never seen before! This competition is free to enter and is open internationally. Entrants of all ages are welcome, but if you’re under eighteen please get permission from a parent or guardian (please let us know in your email if you are under 18 and we will send you a parent guardian form for you to get signed). If art isn’t your bag and you know someone who has some real artistic flair then do let them know about our competition by sharing this blog or our other social media posts so that they know how to enter. We can’t wait to see some beautiful artwork and discover some new talented creators. 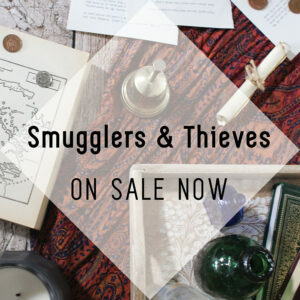 In the meantime, don’t forget that we still have some November SMUGGLERS AND THIEVES boxes for sale, but they are selling fast, so if you’d like to buy one for yourself or a loved one then do hurry over to our subscriptions page and sign up. Remember, this box will include the a beautiful hardback book about adventures at seas, an invite to our members-only online book group, exclusive items designed for us by Sparrow and Wolf and Keeper of the Suns and goodies inspired by Peter Pan, Six of Crows and The Book Thief! We can’t wait!